Exclusively at DevConnections 2011, we unveiled our new product TX Spell .NET that enables you to add extremely fast spell checking functionality to your .NET based applications. It will be available with the new TX Text Control 17.0 release this month. TX Spell .NET will be available for Windows Forms and WPF, but can be used in ASP.NET Web applications or Web services as well. 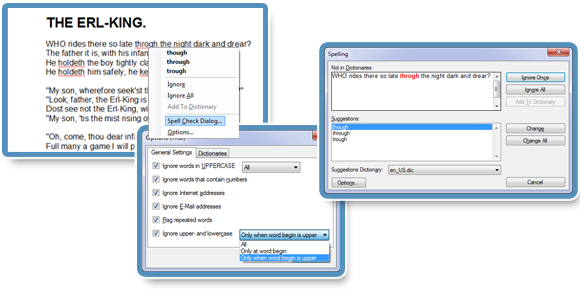 The spell checking component can be used with an unlimited number of dictionaries and user dictionaries at the same time. This enables you to check documents, which contain multiple languages. The freely available and deployable Hunspell dictionaries of OpenOffice.org are fully supported. That gives you a collection of more than 60 dictionaries to download and deploy in your own applications, without buying additional dictionaries. TX Spell .NET has been built from ground up to match the key principles of performance, reliability and accuracy. Very unique is the deep integration into TX Text Control. This allows you to connect many TextControls to a single instance of the spell checker, thus saving resources. If you are attending DevConnections, come to booth #609 and see this new component in action.